The Chevy Malibu stands out as a domestic leader in the competitive mid-size sedan segment. 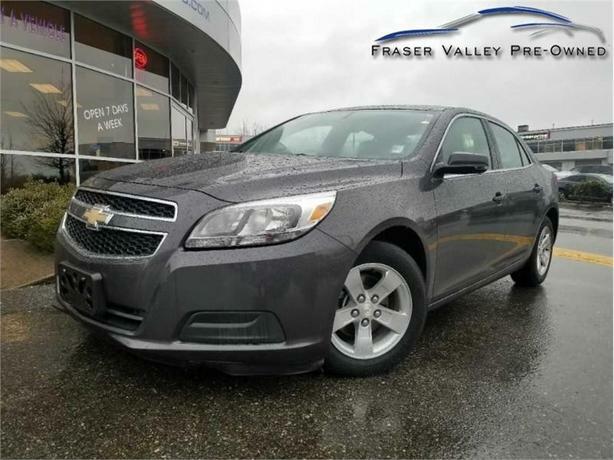 This 2013 Chevrolet Malibu is for sale today in Abbotsford. The 2013 Chevrolet Malibu is a solid midsize sedan that offers a comfortable ride, a long list of standard features and available options and impressive fuel savings. The Malibu has been a constant in the Chevrolet lineup for many years thanks to its solid foundation and value. If you are looking for a comfortable, well-appointed midsize sedan that is a great buy, the Malibu should be on the top of your list.This low mileage sedan has just 51517 kms. It's grey in colour. It has a 6 speed auto transmission and is powered by a 197HP 2.5L 4 Cylinder Engine. Our Malibu's trim level is LS. Even with the base LS, Malibu lets you drive with peace of mind assuring you and your passengers are protected. It comes standard with features including air conditioning, front bucket seats, 60/40 split-folding rear seat, an AM/FM CD/MP3 player, OnStar, Bluetooth connectivity, 6-speaker system, and 16-inch aluminum wheels. Buy this vehicle now for the lowest bi-weekly payment of $103.10 with $0 down for 72 months @ 4.99% APR O.A.C. ( Plus applicable taxes - Plus applicable fees ). See dealer for details.